The simians are the monkeys, cladistically including the apes, the New World monkeys or platyrrhines, and the catarrhine clade consisting of the Old World monkeys and apes. The simian line and the line diverged about 60 million years ago. Forty million years ago, simians from Africa colonized South America, the remaining simians split 25 million years ago into apes and Old World monkeys. Under modern classification, the tarsiers and simians are grouped under the suborder Haplorhini while the strepsirrhines are placed in suborder Strepsirrhini, in anthropoidea, evidences indicate that the Old and the New World primates went through parallel evolution. 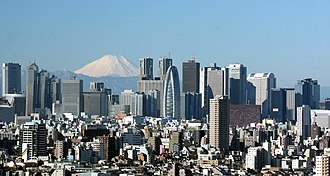 Primatology, paleoanthropology, and other related fields are split on their usage of the synonymous infraorder names and Anthropoidea. 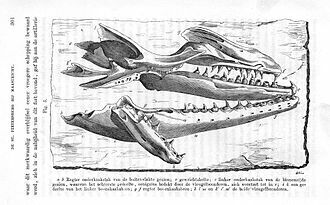 According to Robert Hoffstetter, the term Simiiformes has priority over Anthropoidea because of the taxonomic term Simii by van der Hoeven, from which it is constructed, dates to 1833. In contrast, Anthropoidea by Mivart dates to 1864, while Simiiformes by Haeckel dates to 1866, Hoffstetter argued that Simiiformes is constructed like a proper infraorder name, whereas Anthropoidea ends in -oidea, which is reserved for superfamilies. Australopithecus is an extinct genus of hominins. During that time, a number of australopithecine species emerged, including Australopithecus afarensis, A. africanus, A. anamensis, A. bahrelghazali, A. deyiremeda, A. garhi, and A. sediba. For some hominid species of time, such as A. robustus and A. boisei. If so, they would be considered robust australopiths, while the others would be gracile australopiths, however, if these species do constitute their own genus, they may be given their own name, Paranthropus. Australopithecus species played a significant part in human evolution, the genus Homo being derived from Australopithecus at some time after three years ago. Among other things, they were the first hominids to show the presence of a gene that causes increased length and ability of neurons in the brain, the duplicated SRGAP2 gene. One of the species eventually became the Homo genus in Africa around two million years ago, and eventually modern humans, H. sapiens sapiens. Gracile australopiths shared several traits with modern apes and humans, and were widespread throughout Eastern and Northern Africa around 3.5 million years ago, the earliest evidence of fundamentally bipedal hominids can be observed at the site of Laetoli in Tanzania. This site contains hominid footprints that are similar to those of modern humans and have been dated to as old as 3.6 million years. The footprints have generally classified as australopith because that is the only form of prehuman known to have existed in that region at that time. Australopithecus anamensis, A. afarensis, and A. africanus are among the most famous of the extinct hominins, a. africanus was once considered to be ancestral to the genus Homo. However, fossils assigned to the genus Homo have been found that are older than A. africanus, the genus Homo either split off from the genus Australopithecus at an earlier date, or both developed from a yet possibly unknown common ancestor independently. According to the Chimpanzee Genome Project, the human and chimpanzee lineages diverged from a common ancestor about five to six years ago. Sahelanthropus tchadensis, commonly called Toumai, is seven million years old. 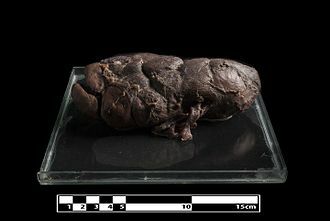 One theory suggests that the human and chimpanzee lineages diverged somewhat at first, the brains of most species of Australopithecus were roughly 35% of the size of a modern human brain. John Edward Gray, FRS was a British zoologist. He was the brother of zoologist George Robert Gray and son of the pharmacologist and botanist Samuel Frederick Gray. Gray was Keeper of Zoology at the British Museum in London from 1840 until Christmas 1874 and he published several catalogues of the museum collections that included comprehensive discussions of animal groups as well as descriptions of new species. He improved the zoological collections to make them amongst the best in the world, Gray was born in Walsall, but his family soon moved to London, where Gray studied medicine. He assisted his father in writing The Natural Arrangement of British Plants, after being blackballed by the Linnean Society he turned his interest from botany to zoology. He began his career by volunteering to collect insects for the British Museum at age 15. He officially joined the Zoological Department in 1824 to help John George Children catalog the reptile collection, in 1840 he took over from Children as Keeper of Zoology, which he continued for 35 years, publishing well over 1000 papers. He named many species, genera and families. During this period he collaborated with Benjamin Waterhouse Hawkins, the natural history artist. Knowsley Park, near Liverpool, had been founded by Edward Stanley, Gray married Maria Emma Smith in 1826. She helped him with his work, especially with her drawings. In 1833, he was a founder of what became the Royal Entomological Society of London, during his fifty years employed at the British Museum Gray wrote nearly 500 papers, including many descriptions of species new to science. He was active in malacology, the study of molluscs, on his death he was buried at St Marys Church, Lewisham. 1821, On the natural arrangement of Vertebrose Animals,1824, A revision of the family Equidae. 1824, On the natural arrangement of the pulmonobranchous Mollusca, annals of Philosophy, new series 8, 107–109. 1825, A list and description of species of shells not taken notice of by Lamarck. 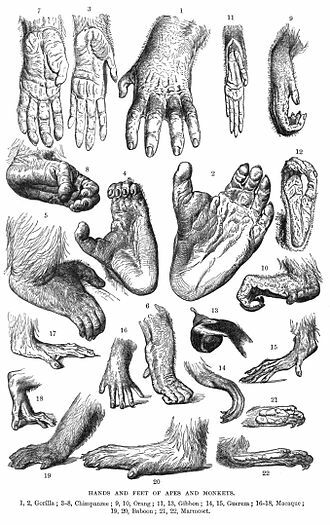 1825, An outline of an attempt at the disposition of the Mammalia into tribes and families with a list of the genera apparently appertaining to each tribe, narrative of a Survey of the Intertropical and Western Coasts of Australia. 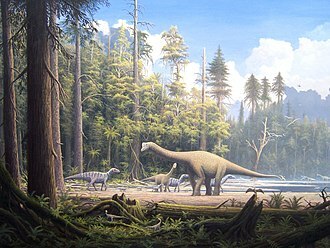 The Neogene is a geologic period and system that spans 20.45 million years from the end of the Paleogene Period 23.03 million years ago to the beginning of the present Quaternary Period 2.58 Mya. The Neogene is sub-divided into two epochs, the earlier Miocene and the Pliocene, some geologists assert that the Neogene cannot be clearly delineated from the modern geological period, the Quaternary. During this period and birds continued to evolve into modern forms. 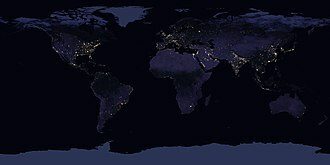 Early hominids, the ancestors of humans, appeared in Africa near the end of the period, some continental movement took place, the most significant event being the connection of North and South America at the Isthmus of Panama, late in the Pliocene. This cut off the ocean currents from the Pacific to the Atlantic ocean. 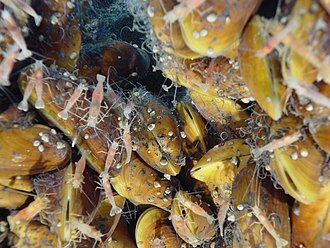 The global climate cooled considerably over the course of the Neogene, the terms Neogene System and upper Tertiary System describe the rocks deposited during the Neogene Period. The continents in the Neogene were very close to their current positions, the Isthmus of Panama formed, connecting North and South America. 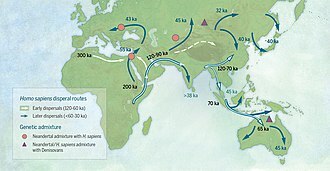 The Indian subcontinent continued to collide with Asia, forming the Himalayas, sea levels fell, creating land bridges between Africa and Eurasia and between Eurasia and North America. 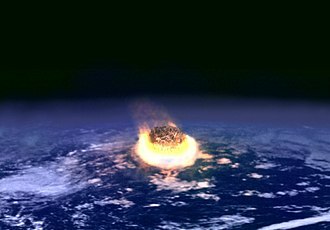 The global climate became seasonal and continued an overall drying and cooling trend which began at the start of the Paleogene. 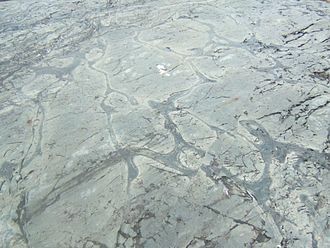 The ice caps on both poles began to grow and thicken, and by the end of the period the first of a series of glaciations of the current Ice Age began and continental flora and fauna have a modern appearance. 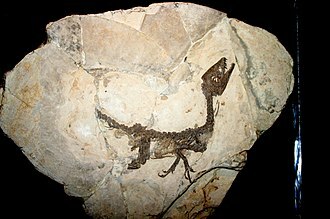 The reptile group Choristodera became extinct in the part of the period. Mammals and birds continued to be the dominant terrestrial vertebrates, the first hominids, the ancestors of humans, appeared in Africa and spread into Eurasia. In response to the cooler, seasonal climate, tropical plant species gave way to deciduous ones, grasses therefore greatly diversified, and herbivorous mammals evolved alongside it, creating the many grazing animals of today such as horses and bison. 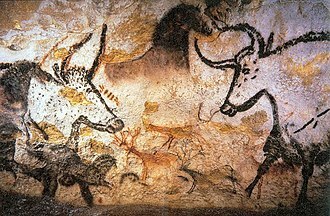 The Neogene traditionally ended at the end of the Pliocene Epoch, just before the definition of the beginning of the Quaternary Period. Bipedalism is a form of terrestrial locomotion where an organism moves by means of its two rear limbs or legs. An animal or machine that moves in a bipedal manner is known as a biped /ˈbaɪpɛd/. Types of bipedal movement include walking, running, or hopping, few modern species are habitual bipeds whose normal method of locomotion is two-legged. A larger number of modern species intermittently or briefly use a bipedal gait, several non-archosaurian lizard species move bipedally when running, usually to escape from threats. 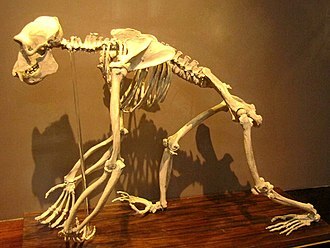 Many primate and bear species will adopt a bipedal gait in order to reach food or explore their environment, several arboreal primate species, such as gibbons and indriids, exclusively walk on two legs during the brief periods they spend on the ground. 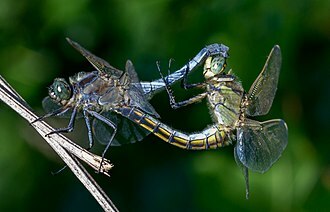 Many animals rear up on their hind legs whilst fighting or copulating, some animals commonly stand on their hind legs, in order to reach food, to keep watch, to threaten a competitor or predator, or to pose in courtship, but do not move bipedally. The word is derived from the Latin words bi two and ped- foot, as contrasted with quadruped four feet and exclusive bipedalism can offer a species several advantages. 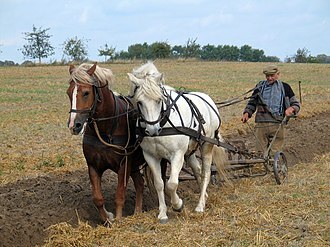 While upright, non-locomotory limbs become free for other uses, including manipulation, digging, even though bipedalism is slower at first, over long distances, it has allowed humans to outrun most other animals according to the endurance running hypothesis. Bipedality in kangaroo rats has been hypothesized to improve locomotor performance, zoologists often label behaviors, including bipedalism, as facultative or obligate. Even this distinction is not completely clear-cut — for example, humans other than infants normally walk and run in biped fashion, but almost all can crawl on hands and knees when necessary. Even if one ignores exceptions caused by some kind of injury or illness, there are many cases, including the fact that normal humans can crawl on hands. This article therefore avoids the terms facultative and obligate, and focuses on the range of styles of locomotion used by various groups of animals. Several revisions in classifying the great apes have caused the use of the term hominid to vary over time. 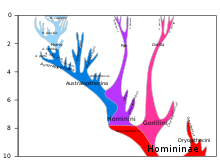 Its original meaning referred only to humans and their closest non-extant relatives and that restrictive meaning has now been largely assumed by the term hominin, which comprises all members of the human clade after the split from the chimpanzees. The current, 21st-century meaning of hominid includes all the great apes including humans, the most recent common ancestor of all Hominidae lived roughly 14 million years ago, when the ancestors of the orangutans speciated from the ancestral line of the other three genera. Those ancestors of the family Hominidae had already speciated from the family Hylobatidae, in the early Miocene, about 22 million years ago, there were many species of arboreally adapted primitive catarrhines from East Africa, the variety suggests a long history of prior diversification. Fossils at 20 million years ago include fragments attributed to Victoriapithecus, the most recent of these far-flung Miocene apes is Oreopithecus, from the fossil-rich coal beds in northern Italy and dated to 9 million years ago. Species close to the last common ancestor of gorillas and humans may be represented by Nakalipithecus fossils found in Kenya and Ouranopithecus found in Greece. Molecular evidence suggests that between 8 and 4 million years ago, first the gorillas, and the split off from the line leading to the humans. Human DNA is approximately 98. 4% identical to that of chimpanzees when comparing single nucleotide polymorphisms, the earliest fossils argued by some to belong to the human lineage are Sahelanthropus tchadensis and Orrorin tugenensis, followed by Ardipithecus, with species Ar. kadabba and Ar. 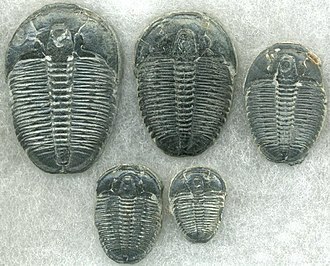 ramidus. The classification of the apes has been revised several times in the last few decades. The original meaning of the referred to only humans and their closest relatives—what is now the modern meaning of the term hominin. And the meaning of the taxon Hominidae changed gradually, leading to a different usage of hominid that today all the great apes including humans. A hominid is a member of the family Hominidae, the apes, gorillas, chimpanzees. 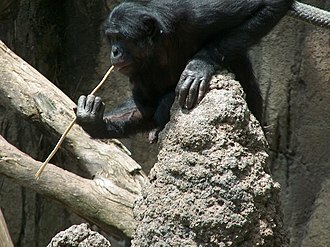 Chimpanzees are one of the two species of the genus Pan, the other being the bonobo. 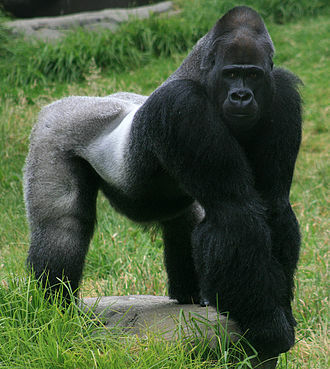 Together with gorillas, they are the only exclusively African species of ape that are currently extant. 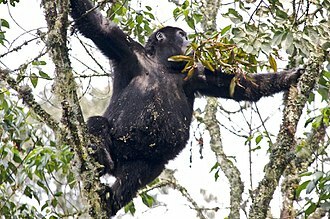 Native to sub-Saharan Africa, both chimpanzees and bonobos are found in the Congo jungle. In addition, P. troglodytes is divided into four subspecies, based on genome sequencing, the two extant Pan species diverged around one million years ago. The most obvious differences are that chimpanzees are somewhat larger, more aggressive and male-dominated, while the bonobos are more gracile and their hair is typically black or brown. 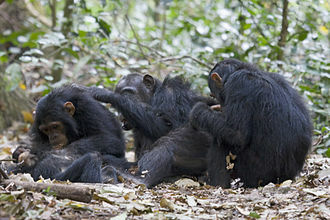 Males and females differ in size and appearance, both chimps and bonobos are some of the most social great apes, with social bonds occurring among individuals in large communities. Fruit is the most important component of a diet, they will eat vegetation, honey, insects. 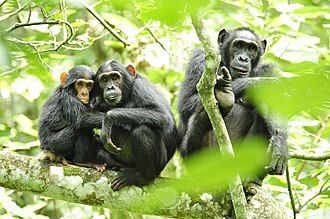 They can live over 30 years in both the wild and captivity and bonobos are equally humanitys closest living relatives. As such, they are among the largest-brained, and most intelligent of primates, they use a variety of sophisticated tools and construct elaborate sleeping nests each night from branches and they have both been extensively studied for their learning abilities. There may even be distinctive cultures within populations, field studies of Pan troglodytes were pioneered by primatologist Jane Goodall. Both Pan species are considered to be endangered as human activities have caused declines in the populations. 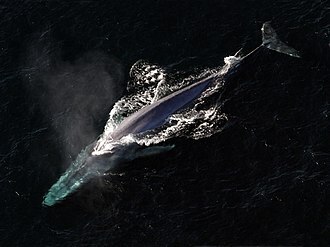 Threats to wild populations include poaching, habitat destruction. Several conservation and rehabilitation organisations are dedicated to the survival of Pan species in the wild, the first use of the name chimpanze is recorded in The London Magazine in 1738, glossed as meaning mockman in a language of the Angolans. The spelling chimpanzee is found in a 1758 supplement to Chambers Cyclopædia, the colloquialism chimp was most likely coined some time in the late 1870s. 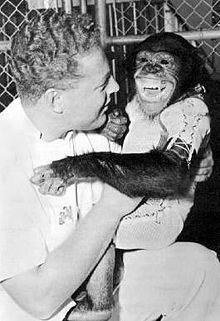 The common chimpanzee was named Simia troglodytes by Johann Friedrich Blumenbach in 1776, the species name troglodytes is a reference to the Troglodytae, an African people described by Greco-Roman geographers. Haplorrhini is a clade containing the tarsiers and the simians. 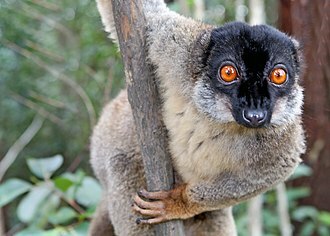 The name is spelt Haplorrhini, the simians include catarrhines, and the platyrrhines. The extinct omomyids, which are considered to be the most basal haplorhines, are believed to be closely related to the tarsiers than to other haplorhines. 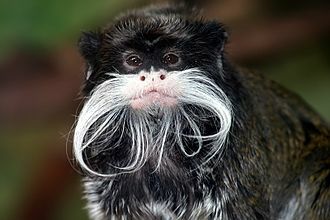 Haplorhines share a number of derived features that distinguish them from the strepsirrhine wet-nosed primates, the haplorhine upper lip, which has replaced the ancestral rhinarium found in strepsirrhines, is not directly connected to their nose or gum, allowing a large range of facial expressions. Their brain-to-body mass ratio is greater than the strepsirrhines. Haplorhines have a plate, unlike the postorbital bar found in strepsirrhines. All anthropoids have a uterus, tarsiers have a bicornate uterus like the strepsirrhines. Most species typically have single births, although twins and triplets are common for marmosets, despite similar gestation periods, haplorhine newborns are relatively much larger than strepsirrhine newborns, but have a longer dependence period on their mother. A bowl of cooked hominy.